1941 and John Holderness’ mother is killed in the blitz. With his father serving in the army he goes to live with his Granddad, Abner Riley, a safe-cracker, and his partner, Merle, an occasional prostitute. Holderness is bright and an avid reader and as an apprentice to his grandfather discovers all the tricks to breaking and entering. In Germany, as the Russians near Berlin, Nell Burkhardt is sent by her parents to her stay with her uncle. As the American’s arrive she drifts to Bergen-Belson and using her gift for languages does her best to help those interned there. Shortly after V-Day Holderness is drafted into the RAF. His quick wit and insolence bring him to the attention of Lt. Colonel Burne-Jones of military intelligence and he’s packed off to Cambridge to learn German and Russian. Holderness has a gift for words and appetite for learning about the world. Once trained he’s shipped off to Hamburg to try and spot Nazis who have adopted new identities. Then in 1947 he’s transferred to Berlin. There he meets and falls in love with Nell and uses his criminal skills to become active in the black market, hooking up with a US Army captain and three British soldiers to sell knocked-off army supplies. Their activities escalate when they start supplying a Russian NVKD major with goods, using a long forgotten tunnel beneath the city. It’s a tunnel that Holderness will return to when he’s asked to extract an elderly woman from East Berlin in 1963. 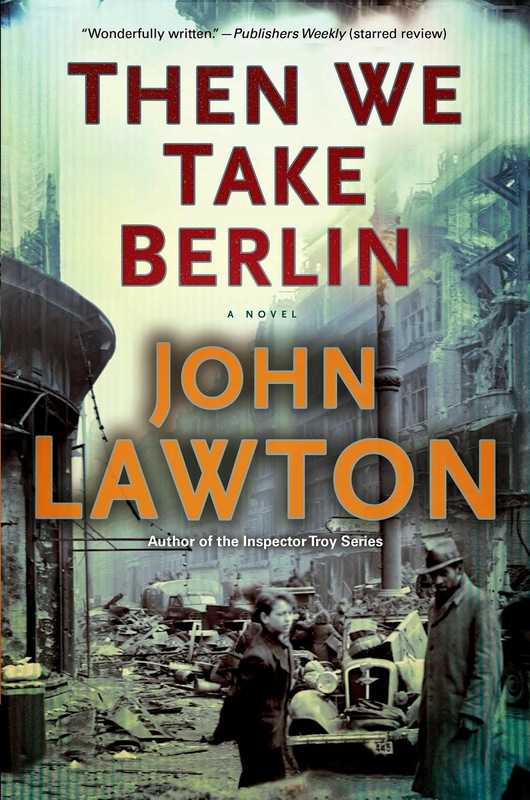 The first third of Then We Take Berlin is a wonderful read. John Lawton provides an engaging introduction to John Holderness early years growing up in East London during the war, that of Nell’s in the last days of the war in Germany, and Holderness’ recruitment into military intelligence. The characterisation is keenly observed and there’s a strong sense of place and context. In the middle third of the book the narrative starts to become more bitty with many short sections charting Holderness’ time in Hamburg and then Berlin as he becomes involved in the black market and starts a relationship with Nell. The final third moves the story through the 1950s up to 1963 and Kennedy’s visit to Berlin, and Holderness’ attempt to extract someone from East Berlin. Here, the narrative is a little sketchy, Nell largely disappears from view, and it’s really not clear what Holderness’ motivations are. There is an odd and confusing timeline shift, with some scenes from 1955 inserted between the transition from 1948 to 1952 for no apparent reason, but the most disappointing aspect is the ending. The story just stops. It feels as if at least twenty odd pages are missing. The novel as a whole reads as if Lawton wasn’t sure where to take it, or quite how to deal with the twenty year span of time. This was a shame as the start was excellent and Holderness and Nell are attractive creations. It’ll be interesting to see how Lawton develops the series.